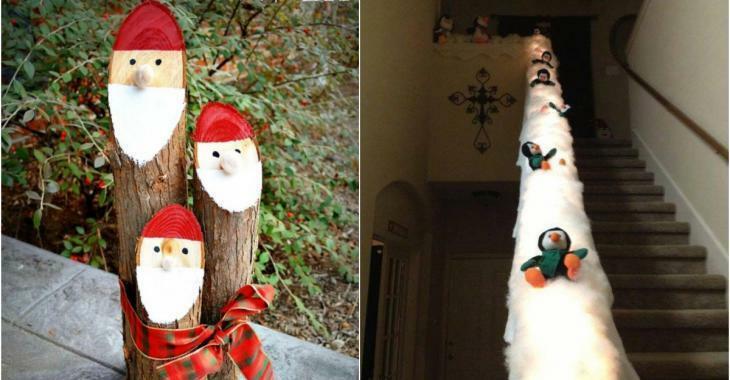 Decoration : Amaze your guests with some of these DIY Christmas decorations! Amaze your guests with some of these DIY Christmas decorations! We are never tired of homemade decorations! They are so in the spirit of Christmas! They also help to counter the overconsumption, while bringing warm, life and love in the house! It's not complicated, you just need some materials and creativity! Take the time to look at these sumptuous ideas, to inspire you in your winter DIY. During the cold days of November you can make decorations for December! Take some wood pallets to make beautiful Christmas trees, which can adorn your home or bring a festive, but natural aspect, to your outdoors. Do not put those ones in the fireplace! If you have a tool to cut wood, you can make these beautiful Christmas balls to adorn your walls. They have a nice modern style! Get old flip flop in the appropriate colors or buy some at discount stores. We can find some for $ 2 a pair! Original! A completely natural decoration ! 6. Giant Christmas light balls! The chicken wire will allow you to achieve this spectacular decoration. All your neighbors will be jealous! Get a piece of stairs, or cut some pieces of wood in your workshop to have a solid stand! Turn your pot lids into a Snowman or Santa Claus using paint and embellishments….love it! Stick two pool noodles together, with strong tape (duct tape) and glue colorful balls! Wow! That one, your cat will not destroy it? Use wood pallets to make this beautiful Christmas tree! No animals were harmed! Cardboard, artificial foliage, pine cones and that's it! Decorate a handrail with cotton wool, fabric, etc. and make stuffed animals like penguins, polar bears, "slide" ! Do you have a lot of plastic cups? Use them to make a nice snowman, in which you will add a light! Take old shutters to create these beautiful characters! Here is another interesting way to install your Christmas stockings! This is the second life you can give to your old tires! Yes, we can do everything with wood pallet ! Beautiful painted logs, winter clothes and that's it! It's as beautiful from the inside as from the outside! Penguins, snowman, elf ... This is so cute!